When I came to the start line, I found Sue Anne from our group, and John our track coach. I knew that John would be going out way faster than I would, so I asked Sue Anne what her planned pace was. She said that she wanted to start with 7:00 minute miles, and then take it from there based on how she felt. Sounded perfect to me, so I decided to run with her for at least the first part of the race. Since Sue Anne has placed in either the Overall group or Masters group every year she has run the Middle Half, I doubted that I would stay with her for very long, but was happy to have someone running the same pace to start. As the race started, we were running at just over 7:00 min miles, and the pace felt fast, but very comfortable. During the fourth mile our overall average was around 7:05 min per mile. I asked Sue Anne how she felt, and if she was going to kick it up a notch. She said that she was good, and thought she might just hold this pace throughout the race. As we finished the fourth and fifth mile, our overall average pace dropped below 7:00 min per mile, and our pace was subtly increasing even faster. As we came out of the 6-mile aid station, Sue Anne was about 10 meters ahead of me, and she never looked back. I looked down at my watch, and I was running just under 6:50 min per mile pace, and knew there was no way I could pick it up to catch up with her and maintain that to the finish. I decided that I would try and hold around a 6:55 min per mile pace for the remainder of the race, and let her go. Miles 7 and 8 felt really good, and I did not begin to feel significant fatigue until well into mile 9. Even with the fatigue, I was able to maintain pace until mile 12 by focusing on the runners ahead of me and one by one trying to catch and pass them. I ran mile 12 at 7:00 flat, and really wanted to finish the last mile strong. For miles 10, 11, and 12 I had been following behind a gentlemen that I thought was close to my age. As we entered into the final mile, I thought there might be an outside chance at placing in my age group so I started trying to catch him. As I passed, I realized that he was much older than me, but it turned out to be good motivation to run the last mile strong. I did the last mile in 6:44, and still had just enough left in the tank to pass one more person as we entered the MTSU track toward the finish line. 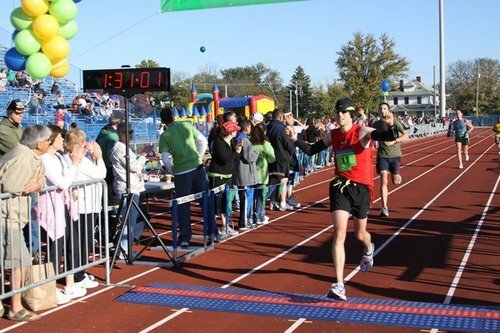 Finish time was 1:31:00 flat….a new PR by over 11 minutes, and over 27 minutes faster than my previous time at the Middle Half. This was good enough for 48th overall (out of 1,778 finishers) and 7th in my age group. Even though I didn’t place, I am still extremely pleased with this result. On a side note, Sue Anne finished in 1:28, placing first Overall Women’s Masters. She ran the second half of the race at 6:27 min per mile pace. WOW! All told, we had 3 people from our group with half-marathon PRs. The Race: Being that this is a smaller, locally organized race, you know that some of the “big race” features and amenities will not be present (e.g. pace teams, elevated mile markers, visible split times, big expo, etc.). With that in mind, it is hard to come up with many criticisms of this event. The organization and execution is impeccable. The course is relatively flat, with a few long, low grade inclines. My Garmin said that was 75ft total elevation change throughout the route. The finish is at the MTSU track which is great, and there is a surprising amount of crowd support throughout the course, and especially at the finish. There were 8 aid stations on the course, each of which had both water and Allsport sports drink. The volunteers at the aid stations were fantastic about calling out exactly what they were holding, and they had very good technique for handing off the cups. Every aid station was organized exactly the same way with water in front and Allsport in the back. At the finish, there is plenty of room to keep moving, and the volunteers immediately give you a bottle of water after finishing and either a wet or dry towel (nice touch!). After receiving your medal, all finishers had access to a post-race food tent with Jim n’ Nicks BBQ, chocolate milk, popsicles, bottled water, bananas, oranges, etc. Another couple of nice features include the Chronotrack D-tag timing system that is disposable. Also, all of the bibs include the runner’s first name, which ultimately leads to the crowd cheering for you by calling out your name. All participants received a Brooks technical, long-sleeved T-Shirt (really nice). There is ample, free parking close to the start line and lots of port-a-potties. 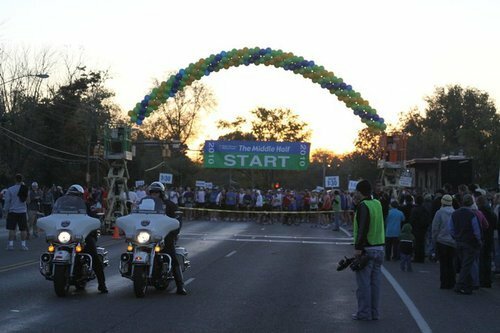 The Course: The course starts just outside of the MTSU track, and heads toward downtown Murfreesboro during the first 5 miles. Really cool to run past Oakland Mansion and around the City square. After leaving the city square, the course has you running down tree-lined Main Street, and then by MTSU’s Fraternity Row and the official geographic center of the great state of Tennessee. The finish is on the the track at MTSU. As I mentioned earlier, the course is relatively flat with some long, low-grade inclines in the second half. All-in-all it is a fast course, and very conducive to running a fast time. 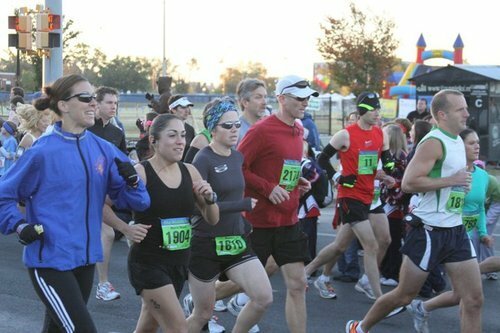 There are three places in the course with switch-backs which allow you to see a lot of the other runners and feed off of their energy. I plan to make this an annual event, as long as I don’t have a fall marathon conflict. This is a great race!